For the next edition of our OVERFLOW chip music concert series we’re trying something a little different, dialing back the high-energy rave and leaning into a world of dreamy piano vibes, pastel colours, and straight up F E E L S. We’re hoping for this to be a special experience for everyone, still loving that retro hardware + software, but perhaps a little softer, a little more relaxing. 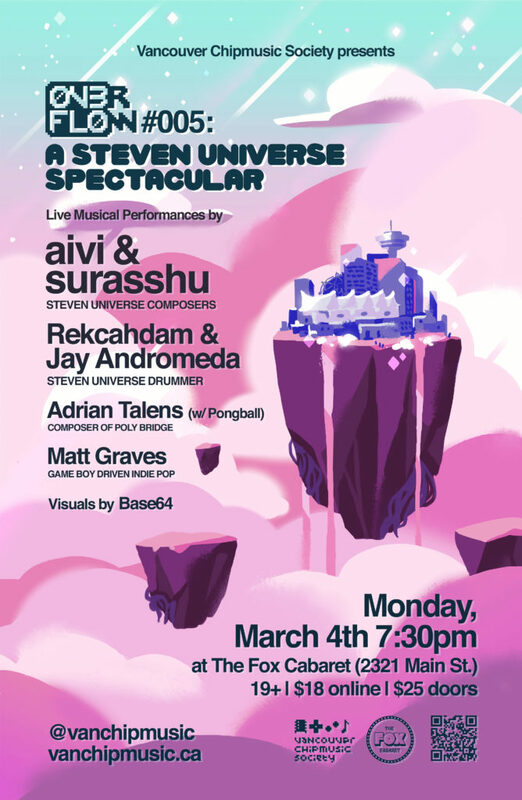 Headlining our show are aivi & surasshu – the incredible composers of Cartoon Network’s STEVEN UNIVERSE and the upcoming indie game IKENFELL. They’re also behind the jazzy chip-and-piano duets of their album BLACK BOX and are making a special trip up from California! Also visiting is RekcahDam (drummer for Steven Universe) with some jams from his various projects, including Celestial Mechanica, Seedling, Band Saga, & more. He’ll be joined by Jay Andromeda on vocals / keys / ukelele / anything else that the two of them might be able to get their hands on! On top of that, we also have Vancouver’s own Adrian Talens, composer of the smash indie game Poly Bridge, as well as Steven Universe Dreamland Arcade! He’ll be joined onstage by our very own Shannon Mason (Pongball) in a special first-time live set! We’d tell you what to expect, but even we don’t know yet! Don’t you love surprises? Rounding out the lineup is Matt Graves, who will be performing his own unique brand of Gameboy-centric indie pop using heavily-modded Game Boys & vocoders! On the visuals front we’ll have BASE64 all night with her trademark glitched-out databending madness.